A curious configuration of Texas presaging the 1850 Compromise following the proposals of Senator Henry Clay. An exceptional 1851 John Tallis map of the United States illustrating an ephemeral period shortly following the addition of Texas, the annexation of California, and the treaties ending the Mexican American War. Covers the United States from Santa Fe north through the Missouri Territory to Canada and east to the Atlantic. The Trans-Mississippi region is exceptionally interesting with a fascinating (if somewhat inaccurate even at the time) depiction of the political geography. A long Narrow Nebraska territory extends to Canada. There is a large 'Western Territory' roughly where Oklahoma is today. The focus of this map is undoubtedly the Texas, New Mexico, and Western Territory political configuration, which when Rapkin drew this map remain unsettled. In the previous edition of this map, 1850, the area that is here New Mexico was part of the original Texas annexation. The Texas border presented here roughly follows the February 1850 proposal of Whig Senator Henry Clay, who recommended that, in exchange for federal assumption of its war debt, Texas surrender all lands north of the 32nd parallel and west of the 103rd Meridian. Those lands to the west of the 103rd Meridian would become New Mexico, those to the north of the 32nd parallel, would be an unorganized territory which Tallis has here dubbed 'Western Territory.' 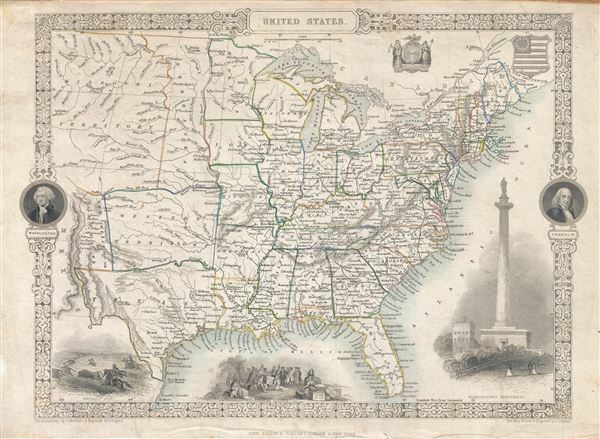 Henry Clay's proposal was not fully adapted, however, it did have an impact on the final compromise finally passed in September of 1850, presumably after this map was set to print. Other areas of interest includes a sprawling Nebraska Territory extending from the Kansas River to the Canadian Border but truncated on the west to the north of St. Pierre by the Missouri River. West of Nebraska, Tallis presents an extensive Missouri Territory extending off the edges of the map. Another anomalous element is Tallis' truncation of the United States at the Rio Grande. Curiously, though Tallis must have been aware of the United States annexation of Upper California (especially since the Gold Rush), as exhibited by his inclusion of the newly created New Mexico Territory, he does not extend the United States beyond the Rio Grande to include its western claims. Why Tallis made this decision is unclear though it may be a case of carto-advocacy in support of Mexico. George Washington and Benjamin Franklin medallions decorate the right and left borders. Several decorative vignettes drawn by J. Marchant and engraved by J. Rogers depict a Native American Buffalo Hunt, William Penn's Treaty with the Indians, and the Washington Monument. The whole has the highly decorative presentation and elaborate border distinctive of Tallis maps. The map itself was drawn and engraved by John Rapkin and issued by the John Tallis and Company in the 1851 edition of The Illustrated Atlas.